To err is human. But one little kink in the coding for website or an app could prove disastrous. Even the strongest, most solid website could still become a victim of any type of cyber attack. A cyber security strategy needs to be a part of life these days, and cyber hygiene needs to be performed on the regular. This is why cyber security is a growing profession, one that takes anything from a certificate to an advanced degree to get yourself a lucrative career. Read on to learn about cyber security careers and how to enter the profession. 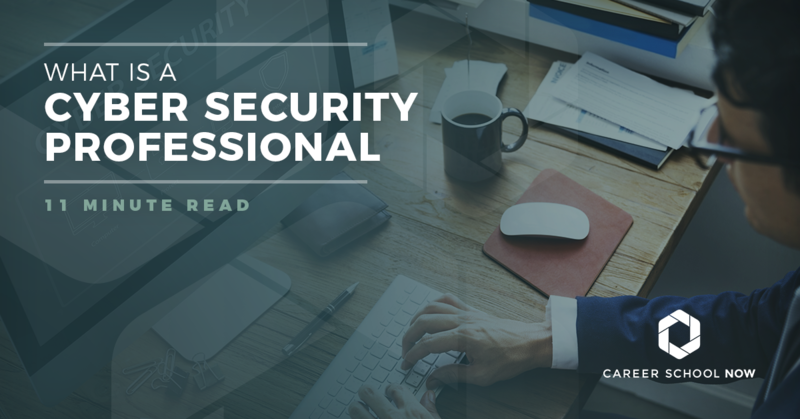 The necessity for cyber security professionals evolved over the years due to an alarming number of threats aimed at sensitive information hosted through servers or on the internet. Cyber security is a field that is rapidly growing in demand for qualified people. In a tidy little nutshell, these professionals are hired to keep online information of all sorts protected from cyber attacks and other malevolent threats. Between the internet and Internet of Things (cellphone, iPads, and other devices that connect to the internet), there are plenty of opportunities for cyber terrorists to move in for attack in order to obtain personal and delicate information. Malware: This software’s sole purpose is to destroy a computer. Malware can be an ad that you click the link to, a virus that was “accidentally” installed, rogue software there to keep your network safe but has malicious intent, or even something that infected your files. Malware is becoming even more advanced as offenders constantly try to stay a few steps ahead of cyber security professionals. Phishing: These threats are emails, texts, and other forms of communication masquerading as a contact or company trying to get sensitive information such as bank account, credit cards, and other personal things. Denial of Service (DoS): This type of cyber attack happens when the server or network is bombarded with messages asking for authentication in an attempt to lock an individual or company out. Man in the Middle: A person with malicious intent intercepts important emails between two parties in an attempt to find out delicate information. It’s like eavesdropping, but through email correspondence. The attacker is able to read emails going between user A and user B. Password attack: This cyber attack happens when someone is trying to gain access to all your passwords in an attempt to take over your network or system. You name it! Whether you’re looking to get a certificate or a doctorate, it’s available. However, this is an emerging field, so not all schools have caught up with the times. Many are just starting to put together cyber security curriculum. But there are other entry points into the field. WHAT KIND OF SCHOOLING WILL I NEED? Cyber security is not only highly in demand, but there is also another benefit: The professionals pull in big bucks. If you’re thinking about going into this field, know that your educational path may be different depending on what you’re thinking of doing. However, the beginning steps to get into most of the cyber security professions are fairly similar. Enroll in a four-year college where you’ll receive a bachelor’s degree in a computer-related field. If your school allows this, complete an independent study project. This will give you some real-world experience as well as a boost on your resume. Find a job as a network and systems administrator or in customer service support to build your experience level. These are entry-level jobs, but they will help you to identify security issues. Certifications are voluntary, but having some is highly regarded by hiring managers. So, consider them. Once you’ve worked for a couple years, you will have gained enough experience to look for a more advanced position, such as an information security analyst. There are quite a few different careers in cyber security. Below are the major ones and how you go about getting into them. The Chief Information Security Officer or Chief Security Officer protects a company’s network and all the sensitive information. The median annual salary is more than $131K. Get a bachelor’s degree in computer or business. Gain experience managing large teams to prove leadership skills. Design IT security system experience. Certifications in IT security and a background in technical programs. Experience in criminal justice and law enforcement is an added bonus. You’re the watchdog of a company’s system, always on the lookout for a potential cyber threat. Security analysts make an average salary of $76K. Get a bachelor’s degree in computer science, information assurance, or a related field. An MBA in information systems is preferred. Have experience in a related occupation such as information technology department or systems administration. Certifications are optional but recommended. From this position, you can advance to Chief Security Officer (CFO) after a few years of experience. You’ll design, build, and maintain the computer system’s entire security structure for the company you’re employed for or contracted with. Security architects make an average salary of $125K. Get your bachelor’s degree in computer science. It’s not a requirement, but it makes you more employable. Have a background in software engineering. Complete an internship to gain more work experience. Work for a few years in information technology. Get your Certified Information System Security Professional through the International Information System Security Certification Consortium. Think about getting a Certified Ethical Hacker certificate, as well. Once you’ve been working for a few years, you’ll be qualified to move up to Application Security Architect. Consider a career in management. You’re a computer engineer with a focus on security solutions when it comes to the design of computer systems. Security engineers make an average of $83K per year. Get a bachelor’s degree in computer science, cyber security, or another related field. Have 5-10 years of work experience. Consider joining a networking group of likeminded people. Subscribe to publications keeping you up to date on all the latest in technology. You work with law enforcement and/or private firms to extract information from computer systems that have been subjected to a cyber attack. The salary for computer forensic experts is more than $90K yearly. You can start out with an associate degree in digital forensics, but you’ll need to transfer to a four-year college to get your bachelor’s degree. Become a GIAC Certified Forensic Analyst. Other certifications you can test for are Certified Forensic Computer Examiner, Advanced Computer Systems Security, Computer Forensics, and Advanced Computer Forensic certifications. Apply for, interview, and get hired into a position. Also called a “pen test,” but certified ethical hacker is a bit sexier. You have authorization to test a network by performing a controlled cyber attack to find any vulnerabilities. Certified ethical hackers earn an average of $95K per year, and penetration testers make $80K. You must have two years of experience in security or a related field. Enter the CEH training program. Go through a background check or a personnel security investigation. You will develop the software designed to protect computers from cyber attacks based on identifying any security issues. The average salary for security software developers is $69K. Get your bachelor’s degree in computer science, mathematics, network securities, or another related field. Or receive on-the-job training along with proper certifications. The sweet spot for years of experience is five; that’s what many employers look for. You are considered the firefighter of computer security, identifying threats within the network and using available tools to fix the problems and make sure they never happen again. The average annual salary for incident responder positions is $76K. It’s not completely necessary to have a bachelor’s degree, but if you do want one, get it in computer science, cyber security, math, or another related field. You can get an associate degree in computer science or something similar. To get an entry-level position, you need three years of experience. You are the go-to person when it comes to any security issues, and you’ll come up with best security practices for the company you work with so they can avoid future attacks. Earn an average of $76K per year as a security consultant. You must have a bachelor’s degree. The most common one for security consultants is computer science. If you have a background in criminal justice, it could help move you up the ladder. Expect some on-the-job training once you secure a position. Earn certifications from professional organizations such as Certified Security Consultant or a Certified Protection Professional. Problem solving as one of your super powersCan I move from an IT job to cyber security? CAN I MOVE FROM AN IT JOB TO CYBER SECURITY? If you got into IT without going to college, then you may want to consider getting that bachelor’s degree in computer science or a related field. In one of the cyber security fields, find an entry-level job where you will be trained with loads of hands-on experience. You may know this already, but you must know code. Yes, all of them. Know the cloud. Know it real well. Information Systems Audit and Control Association involves cyber security professionals from around the world. Association of Information Technology Professionals has chapters worldwide that involve webinars, conferences, awards, a career center, and more. Information Technology Infrastructure Library is an open site, welcoming other IT security professionals to be involved in order to create the most understandable, comprehensible best practices guide to cyber security. Forum of Incident Response and Security Teams is a global first response team. But they also have conferences around the world, offer access to best practice documents, have hands-on classes, and more. SANS Institute is a go-to source for security training, research, and certification. It was established in 1989 as a co-op research and education organization. Information Systems Security Association is a network of over 10,000 professionals around the world with local chapters that offer everything from support to certifications. Center for Internet Security is a joint effort of professionals attempting to safeguard the Internet against threats. For many cyber security professionals, the salary is just an added bonus that comes with a career they consider to be highly interesting, important, and meaningful. Salaries average in the $110Ks for most of the positions, especially after you’ve been in the profession for around five to seven years. Granted, variables such as location, position, industry, and experience factor into pay, so yours could be way over or under that average. On a whole, the careers within the cyber security realm are growing tremendously. Information security analysts, the only related career on the Bureau of Labor Statistics site, will grow by 28 percent through 2026. You can expect most of the related positions to grow equally as much, especially as more cyber attacks happen. In other words, if you train for a position and get those certifications, then there will be a job waiting for you to step into. Going through an online cyber security program makes it very convenient, especially if there are major factors in your life that prohibit or impede being able to attend classes in person. There are many programs offering online education if you want to go into cyber security. You can get an associate, bachelor’s, or even master’s degree going through an online school. However, be certain that your program is accredited, otherwise you may not be able to get those important certifications.